Many IP-savvy VCs know from experience that valuation depends on a company’s intellectual property (IP), that is, its patents, trademarks, copyrights, and trade secrets. A return on investment can turn on a successful IP strategy and the IP assets and defenses it creates. Done right taking action on IP enhances valuation and freedom-to-operate, and rewards a culture of innovation. Done wrong it leads to wasted resources, missed opportunities, lost assets, and even greater threats from competitors or counterfeiters. For IP-savvy VCs the issue of IP protection becomes: how best to proceed? Here are 4 tips we recommend. Simply put, set a strategy for your IP. Then list everything, use everything and score everything. Apply these tips early and often. Such aims can be a start but we recommend articulating an IP strategy with measurable performance goals. Time should be spent to develop an IP strategy tailored to a company’s business goals. 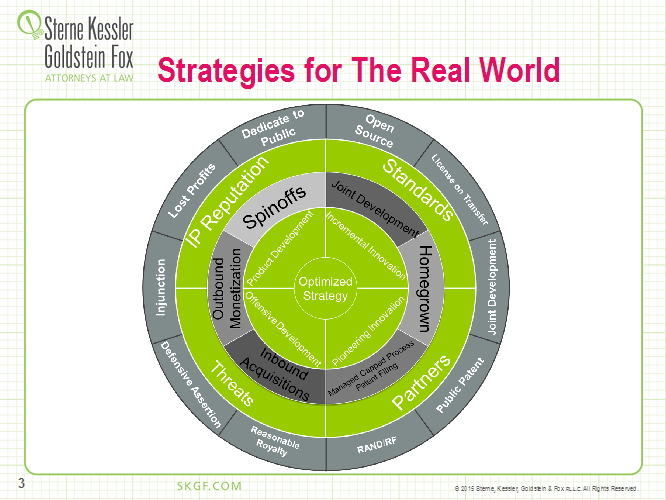 This IP strategy should align with and be an integral part of a company’s business plan. Broad principles and specific objectives should be identified. Insist on measurable goals that depend upon the company’s products, services, and current and future revenue goals. On the protection side such goals can be a certain number of quarterly IP harvesting sessions, copyright registrations for authored works such as a source code, user manuals, product brochures or web pages, trademark filings, or new patent filings. On the freedom-to-operate side, goals can include a number of defensive publications, third-party submissions, inter partes reviews, or licenses. For example, a component manufacturer may identify an IP strategy that builds equity in trademark names that can be recognized by resellers and integrators. A software company may identify an IP strategy that employs state-of-the-art best practices in source code archival and configuration management to support version control, licensing to different customers, and distinguishes open source from proprietary code. A company about to launch a new generation of products may articulate a global patent strategy that covers new markets expected to reach at least 10% of revenue. Quarterly scoping of products with a goal of ten new invention disclosures and a yield of 2 new patent filings per quarter can be set. Depending on the level of innovation, 5%-10% of an R&D budget for new products can be a benchmark for patent spending and freedom-to-operate strategy. This benchmark can be higher or lower depending on patent values and level of enforcement in a particular industry. Moreover, a host of new patent office options and software tools allow executives to manage and monitor patent portfolios. Data analytics tools, such as those available from Aistemos, Aquana, Thompson Reuters and others, now allow much more effective analysis of competitor behavior. Many of these tools have only been out for a year or less. Soon we expect to see the power of these tools and their analytics used to set IP strategy in more robust ways. 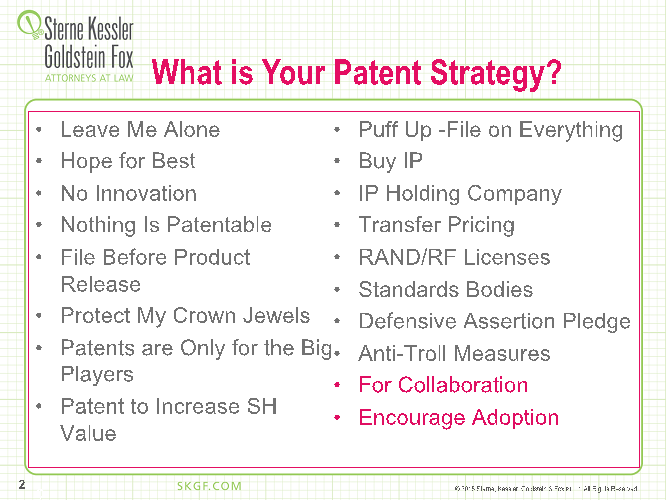 It can sound trite but list your IP. This includes taking stock and carrying out an audit of all forms of intellectual property. IP-savvy VCs know that any due diligence for M&A, IPO, or new investment will involve a due diligence of IP. Be proactive. This avoids loss of rights later and ensures better decision making up front. Inventory. Take stock of all IP in your company. Review protected/registered and unprotected/unregistered IP. Generate schedules of patent, trade/service marks, trade dress/design rights, copyright holdings and trade secrets. Identify trade secrets (such as source code, customer lists, market information, R&D information, and technical know-how), and procedures in place to protect trade secrets. Collect and organize all license agreements, joint development agreements, settlements, non-disclosure agreements, materials agreements, assignments and other agreements conveying intellectual property rights. Confirm ownership. Make sure copies of employment agreements, invention agreements and assignments are reliably stored for ready access. Record ownership where advantageous at the USPTO to protect bona fide purchaser rights. Confirm freedom-to-operate. Review open source code and other license obligations (such as representations, warranties, license terms, and indemnifications) that can impact freedom-to-operate or product release. List pertinent agreements and term expirations. Flag encumbrances that impact freedom-to-operate. Check the process for handling cease and desist letters and offers to license received from other parties. Assess how such issues are to be resolved. List any pertinent insurance policies. List defensive patent assertion pledges, license-on-transfer obligations, and defensive patent assertion memberships. Having listed and gotten your arms around IP, use it. First, reward a culture of innovation. Recognize your authors and inventors. This can be additional compensation for meeting milestones like submitting a copyright registration or patent application. Teams can be recognized for holding brainstorming sessions or scoping R&D before release. Include schedules of IP assets on loan applications, investor reports and in Board presentations. meetings. Second, take advantage of your rights. Mark products with patent numbers to gain the advantage of product marking in patent damages. Use trademarks and registered marks correctly to identify your company as a source, and police infringing marks. Take anti-counterfeit protection measures at borders and other points of entry or sale. Play offense and defense. This holds for copyrights, trade secrets, trademarks and patents. Patent portfolios for example can be managed according to offensive and defensive aims. Many prominent high-tech companies generate new invention disclosures according to a forward looking or offensive approach aimed at future markets or areas that competitors are expected to move into. Others generate new invention disclosures and create patent portfolios around existing R&D and product development as part of a bottom up approach to protect products prior to release. Some patents are held to deter competitors or for licensing. Other patents are identified to be spun out in a new business entity. Some patents may be included in a licensing or enforcement campaign or sold to a patent assertion entity for monetization. The offensive or defensive goals can then impact how claims are drafted and negotiated with Examiners. This can help decide whether applications are examined on a fast track or continued aggressively. 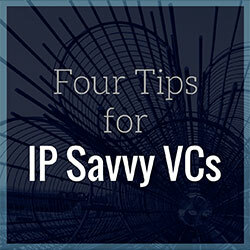 We recommend assigning a value to your IP. This is especially helpful for patents and patent applications which can be expensive to obtain and maintain. Many companies such as Philips are recognizing the value of scoring everything. For example, each new invention disclosure can be rated. Likewise, a new patent application can be rated. The rating or value should be adjusted during prosecution as scope is narrowed or changed. Some companies we work with adjust the rating for each office action cycle of a case. Issued patents likewise should be scored. Some companies even assign a specific estimated dollar value to each of their patents. One benefit of this scoring is to help a business unit assess its return in investment and compare the value of its patent portfolio with other costs and revenue in the business unit. Scoring also encompasses knowing what a company’s assets cover. This includes making sure decision makers know what subject matter is covered by their patent portfolios. This means knowing which patents and patent applications cover a particular product or technology. Various techniques companies have used to do this are a subject matter classification, product groups, and tag clouds. Better software and automated processes now can help input scores, and track and generate reports with scoring information for IP assets. In many cases, scoring can be carried out with only a modest extra effort yet realize important benefits in helping companies maximize use of their IP. At its heart, IP impacts innovation, creativity and the control of knowledge assets. Despite being an intangible asset, IP can be managed to drive innovation and help the bottom line. For three decades, IP rights have expanded across the globe. New procedures and processes continue to be made available that give even more options to decision makers that can help carry out specific IP strategies. Even the recent tightening in the United States of patentability standards and enforcement rewards companies that take advantage of as many new protection and freedom-to-operate options as they can. All of this depends on the recommendations here: a company’s ability to articulate its IP strategy, and then list, use and score all of its IP. [i] M. Messinger, Environmentally Sustainable Patent Strategies, IP Law 360, Sept. 15, 2015. [ii] M. Messinger, “Sustainable Patent Strategies: Value in an Age of Patent Reform,” Energy, Utility and Environment Conference (EUEC) Presentation, Feb. 2016, San Diego, CA. [iii] M. Phelps, Burning the Ships, 2006. 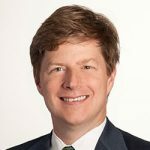 Michael V. Messinger is a Director in the Firm’s Electronics Practice Group and the leader of the Firm’s Alternative Energy and Climate Change practice area. He handles complex patent matters involving inter partes and post-grant review, reexamination, reissue and appeals. Mr. Messinger works with company managers, directors and employees to identify and leverage IP assets. He is a leader in the area of fast-track patent examination in the United States and abroad. He has extensive experience in prosecuting U.S. and international patent applications and developing strategic patent portfolios. He may be contacted at mikem@skgf.com. Krishan Y. Thakker is an Associate in the Firm’s Litigation Practice Group, and focuses his practice on general IP enforcement and patent infringement, with a special emphasis on pharmaceutical patent litigation under the Hatch-Waxman Act. 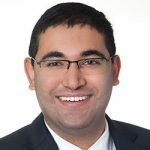 Mr. Thakker represents clients in matters before several federal district and state courts, as well as in domestic and international arbitrations and mediations. He may be contacted at kthakker@skgf.com. An informative and insightful article. Useful .